Nestled on Florida’s Forgotten Coast, Carrabelle Beach RV Resort is near tons of fun attractions, delicious restaurants and exciting activities! 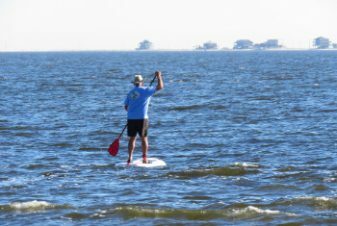 Although our beaches are quiet and uncrowded, there are countless things to do in Carrabelle. If you want to learn about the town’s rich, coastal history, stop by one of Carrabelle’s fascinating museums or check out the famous Crooked River Lighthouse, originally built in 1895. Ready for a bite to eat? Carrabelle is home to a number of excellent eateries, from fine waterfront restaurants serving up steaks and fresh seafood to laid-back barbecue and pizza joints. Camp Gordon Johnston WWII Museum: This remarkable museum commemorates the amphibious WWII soldiers who trained at the camp near Carrabelle. Which also is an easy walk from the resort. St. James Bay Golf Resort: Situated on the scenic Forgotten Coast Highway just 10 miles east of our resort, this championship 18-hole golf course is open to the public Tuesday through Sunday. Edward Ball Wakulla Springs State Park: Located 44 miles northeast of our resort, this beautiful state park offers world-class wildlife viewing and amazing river boat tours. Apalachicola National Forest: The largest forest in Florida, Apalachicola National Forest is brimming with trails, streams, rivers and lakes. This forest is a must-see for nature lovers! Apalachicola National Estuarine Research Reserve: One of the most productive estuarine systems in the Northern Hemisphere, this reserve is located in nearby Eastpoint. Tate’s Hell State Forest: This botanically diverse attraction is a famous for wildlife viewing, canoeing, boating and fishing. Apalachicola: The town lays claim to a beautifully restored historic district like none other in the Florida Panhandle. Throughout Apalachicola’s historic downtown commercial district, you will stumble across eclectic boutiques, unique eateries, art galleries and popular music venues tucked into brick, tin-roofed warehouses. St. George Island: One of the least inhabited and unspoiled natural wonders of Florida, this beautiful barrier island is teeming with pristine beaches, biking and jogging trails, charming shops and restaurants. St. Vincent Island: Established as a National Wildlife Refuge in 1968 for the protection and conservation of migratory birds, this undeveloped barrier island is now a protected habitat for endangered plant and animal species. It also provides a variety of recreational activities. Crooked River Lighthouse: Located right here in Carrabelle, Crooked River Lighthouse was originally built in 1895. Guests can climb to the top of this striking lighthouse or browse through the Keeper’s House Museum and Gift Shop. St. George Island Lighthouse: Climb 92 stairs to the top of the lighthouse to take in breathtaking views of the Gulf of Mexico, Apalachicola Bay and St. George Sound. World’s Smallest Police Station: In the early 1960’s, Carrabelle’s police phone was located in a call box bolted to a building at the corner of Hwy. 98 and Tallahassee Street. Featured on “Ripley’s Believe It or Not,” and the “Today Show,” the World’s Smallest Police Station is located at 105 St. James Avenue in Carrabelle. Gulf Specimen Marine Laboratory Aquarium: A unique collection of sea water tanks and aquariums. Unlike most big public aquariums that emphasize porpoises and big fishes, this facility focuses on creatures such as seahorses and hermit crabs, emerald eyed spiny box fish, electric rays and red and white spotted calico crabs – just a few of the endless living treasures of Florida’s Forgotten Coast. Carrabelle Riverwalk & Wharf: This unique Riverwalk features informational kiosks detailing Carrabelle’s waterfront history, a cement boat launch ramp, handicap accessible fishing piers, fish cleaning stations and pavilion with picnic tables. Carrabelle History Museum: The Carrabelle History Museum is truly a community treasure. This museum walks the visitor through Carrabelle’s amazing history. It includes ancient pottery shards and fossils; the history of a bustling commercial port for the turpentine, lumber and fishing industries; and yearbooks, newspapers and family photos which accompany an endless supply of fascinating stories. John David Patton Wildlife Park: Offering birders and nature enthusiasts a perfect place to relax, this Carrabelle park includes nature trails, educational signage and picnic facilities.